My kids are tattoo fiends of a sort. I’ve always thought I might like a tattoo if I could get the Right Thing. That thing, of course, is my accordion, the Saltarelle Pastourelle III. 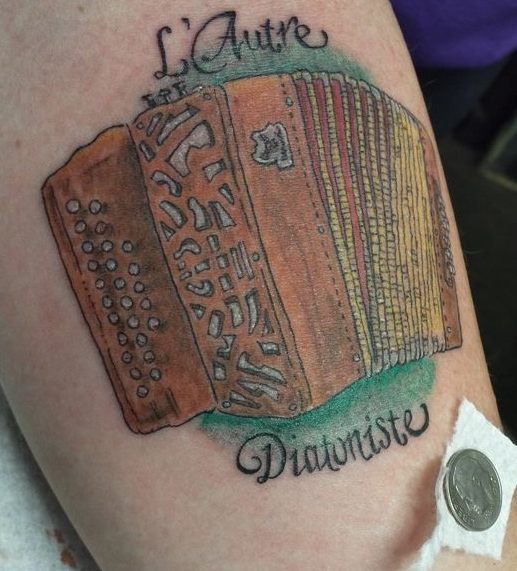 I wasn’t just looking for a generic diato tattoo, it had to by My Box. My kids found an artist who could do such a thing and, as a gift, they paid for the below tattoo. The artist is Moonman Sam Hill, in Hallowell, Maine. I’ll let the work speak for itself, but I am delighted by the R. Crumb illustrative quality of it. The words are, L’Autre Diatoniste, which is also the name of … y’know … my CD. That dime is there to give you a sense of scale and level of detail. That’s on the inside of my forearm. Also, since everyone asks, yes, it hurt like a M*&^#r F*&^%r.